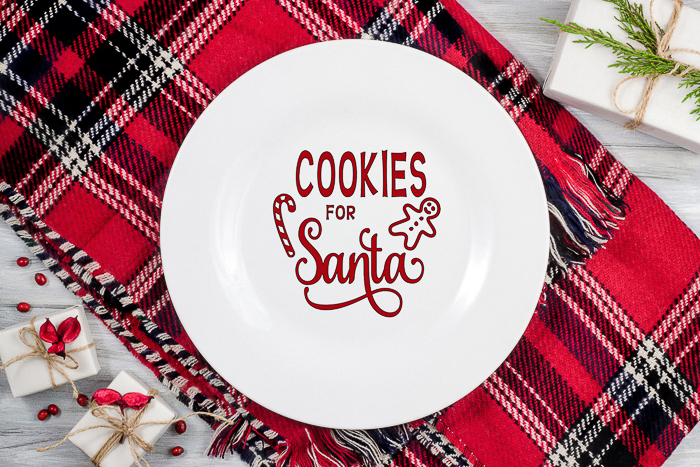 Need a cookies for Santa plate for your little one for the holidays? You can make one with your Cricut machine. I have a link to a cut file below then you can to a plate using either regular vinyl or even iron-on. A simple project that the little ones will love! 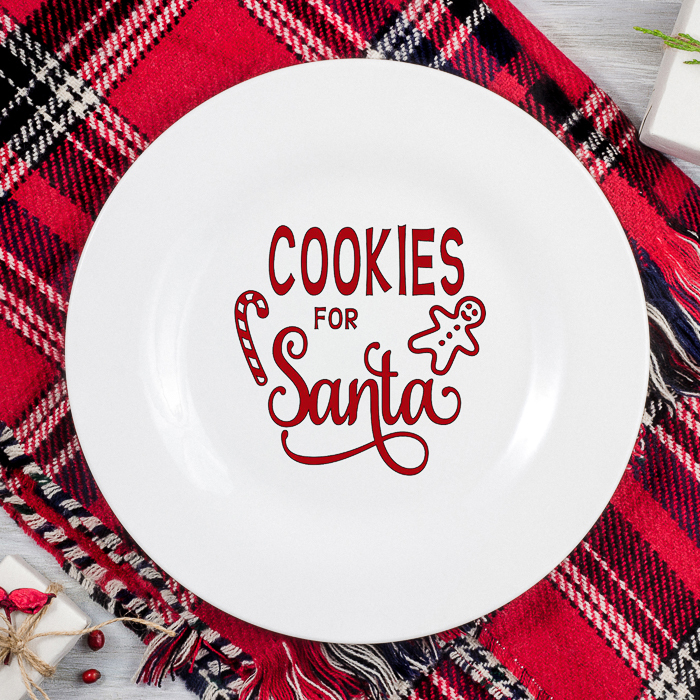 Add those cookies for Santa to this special plate year after year. Some links may be affiliate links which means that you do not pay anymore, however, a small commission will go to this site. Open the cut file and size to fit your plate. Cut from either permanent vinyl or iron-on. Either will work on a glass plate. I like the ease of the permanent vinyl and I have successfully washed it in a dishwasher. I have not had luck with the iron-on in the dishwasher, however. Be sure to mirror the iron-on before cutting and cut with the shiny side down on the mat. Then apply your design to the plate. You can add the vinyl by using transfer tape or apply the iron-on using the EasyPress or an iron. Be sure to clean your plate before application. I like to use rubbing alcohol to clean mine. Then enjoy your cute cookies for Santa plate! Add cookies to the plate and set them out for the jolly one himself. You can use a clear plate and apply your iron-on or vinyl to the back of the plate as well. This helps with any issues with being food safe. If you do this, mirror if cutting from vinyl and do not mirror if cutting from iron-on. You just want to do the opposite that you usually do if putting on the back of the plate. 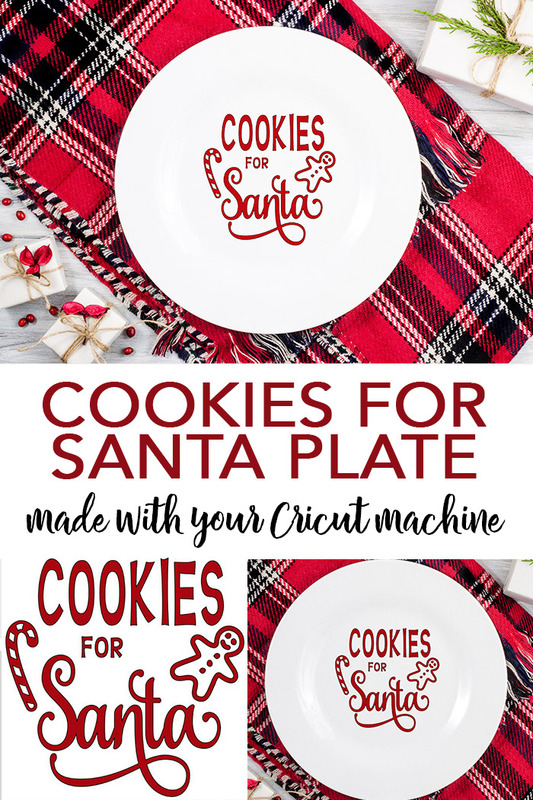 Love this cookies for Santa plate and want more ideas? Try the links below. next post: Heat Press Versus EasyPress: Which One Do You Need?